This pineapple and coconut Hawaiian bubble bread (also known as pull-apart bread, or monkey bread) is one of the easiest and best tasting recipes for breakfast, brunch, snack, or dessert! I’m excited to share this Hawaiian Bubble Bread with you today. The biggest reason I’m excited for it is because it has Hawaiian flavors involved, and as you know, I was in Hawaii for the first time back in June. I became absolutely infatuated with anything and everything to do with it. It was the most beautiful, romantic place and my new favorite vacation destination I have ever been to. I even feel that way after I had to fly 10+ hours each way to get there. I normally am the worst when it comes to long flights! I brought this easy pull-apart bread to “breakfast night” at our church’s life group back in June. Not surprisingly, it got rave reviews. I mean, just look at it! It’s awesome looking and awesome tasting. My mom used to make something similar to this when I was growing up and my brothers and I loved it. Those gooey rolls were always a big hit and are simple to put together. Some know this as Monkey Bread or Pull-Apart bread, but no matter what you happen to call it, it’s super delicious. The fresh sliced banana, coconut addition, and pineapple-orange-banana juice provide tropical flavors in the glaze poured over the bread to give it that island flavor. If you like this, you might really like the Tropical Orange Pineapple Banana Bread I made recently. I also made these Hawaiian Pineapple Chicken Sausage Kabobs. Check them out! Visit my how-to recipe for the step-by-step process on how I made this Hawaiian Bubble Bread! Dissolve the sugar and yeast in the warm water and let stand for 5-10 minutes. In a blender, blend the banana, ½ cup of the juice, honey, and butter until smooth. Set aside. Spoon 2 cups bread flour into a measuring cup using this method. In a large bowl, sift together the bread flour and salt, then add the yeast mixture and the banana mixture from the blender and stir until well combined. Measure out another level 2¼ cups bread flour and stir it into the mixture until it forms a nice, soft dough. Flour a clean counter top or cutting board and place the dough on it. Knead until the dough it is elastic and smooth, about 8-10 minutes. Add, 1 tablespoon at a time of the remaining flour, as needed, to keep the dough from sticking to your hands during this step. Coat a large bowl with cooking spray and place the kneaded dough in it, flipping the dough on each side to coat to coat it with the spray. Cover bowl with a damp cloth and let dough rise in a warm place for about 1½ hours or until the dough has doubled in size. Once it is doubled, punch the dough down once last time and place it on a lightly floured surface and let it rest for 5 additional minutes. 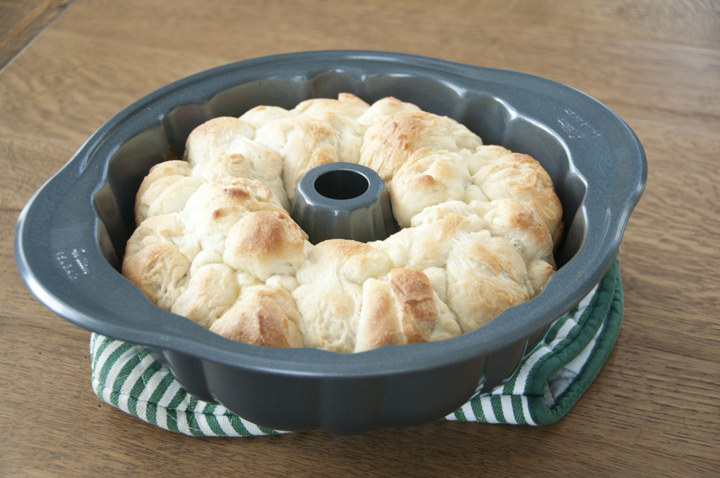 Coat a 10-inch bundt pan with non-stick spray. Pull away pieces of dough and form them into balls about 1½ inches in size (about 30 balls). Layer the dough balls in the prepared bundt pan and set aside. In a bowl stir together the cream of coconut and 4 tablespoons of pineapple-orange-banana juice. Pour 4 tablespoons of the mixture over the dough in the bundt pan and set aside the rest of juice mixture. Cover dough in bundt pan with a damp cloth and let rise for 1½ hours or until doubled in size. Remove cloth and bake in preheated oven for 30 minutes. Remove pan and let the bread cool in the pan for about 20 minutes. Turn bread out onto a wire rack to cool completely. Cut the bread into slices or put it in the middle of the table and use the "pull apart" method. Enjoy! 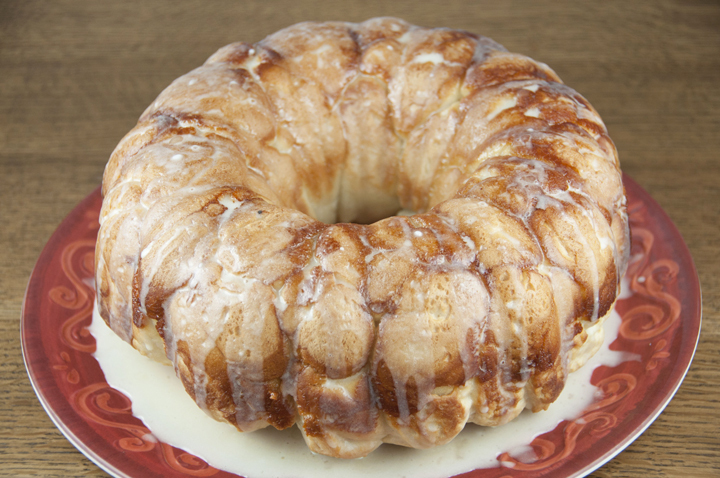 I don’t care what you call it, I love “monkey bread” and I love the addition of the pineapple banana orange juice! This looks fantastic. I would be easily, if not temporarily, transported to Hawaii with this! 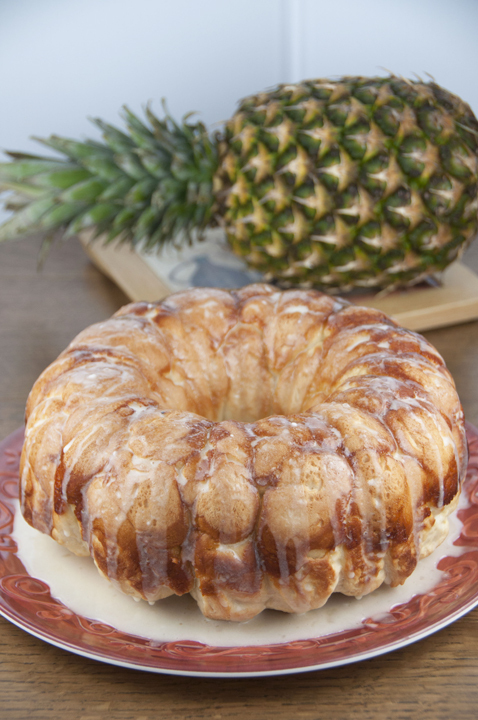 Brilliant twist on monkey bread Ashley – you have amped up the NOM factory with that OJ and pineapple!!! 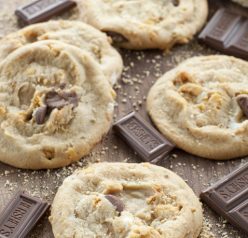 Love the flavors – great variation on a classic recipe! I’ve not been lucky enough to visit Hawaii, but I’d love to. But this bread is probably the next best thing to being there — how nice this looks! Love this — thanks so much. 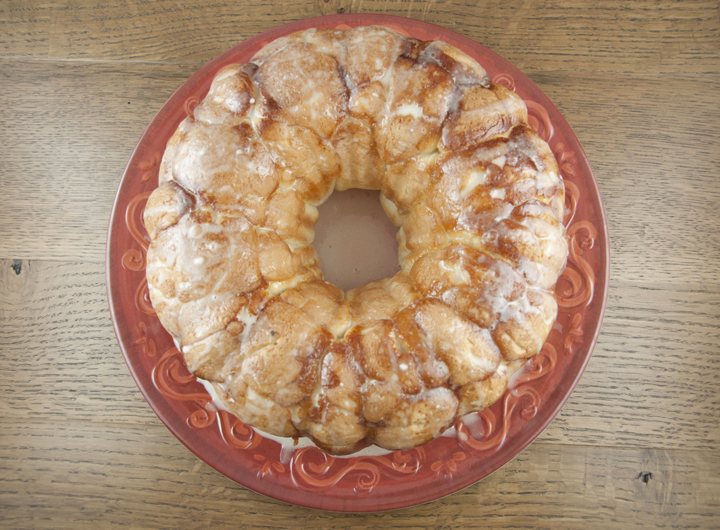 Monkey bread was a staple in our house growing up but we only had cinnamon flavored. I LOVE the fact that this has bananas and juice in it! You had me at Hawaiian! I would love a big slice of this with my nightly coffee….yum! This looks absolutely amazing. I would gobble this up all by my lonesome. Ahhh yes! Love this Hawaiian twist on Monkey Bread! Ashley, this bread sounds incredible! 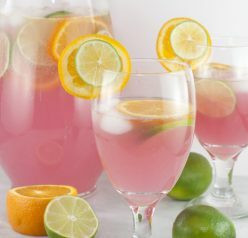 I love those tropical flavors, and definitely need to try this! 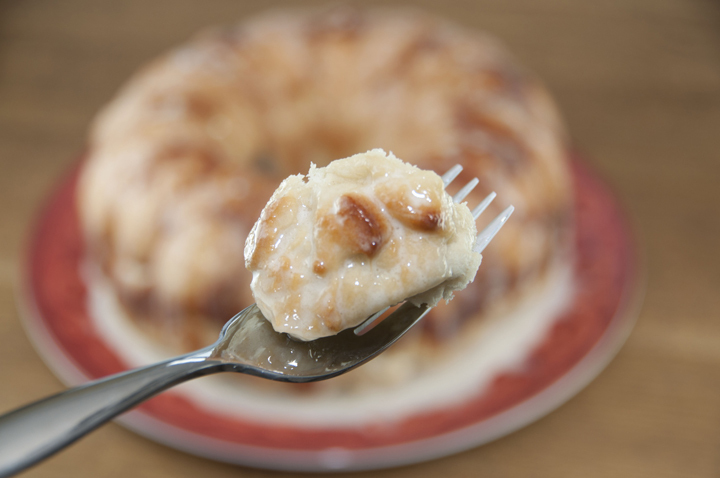 This Hawaiian version of Monkey Bread looks fabulous Ashley! Love that you used cream of coconut for the glaze. That stuff is the best! This looks great! I’d love to visit Hawaii someday but I’ll settle for this bread for now. This bread has pretty much stolen my heart. Darn, it looks too good! 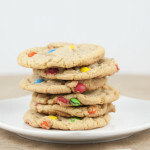 Ashley, this looks absolutely delish! Sweet, yet fresh! Fun dish! Love the name and the way it looks. Bet I’d like the way it tastes even more! Excellent recipe, Ashley! This is my kind of treat! Can I prepare a homemade juice? Thank you so much! yes, of course! Just found this recipe. It sounds wonderful. Can the dough be made lin a bread machine?